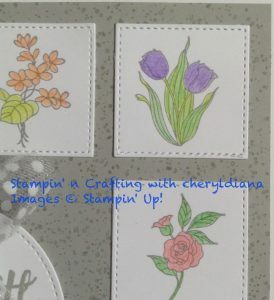 Welcome to Stampin ‘n’ Crafting with cheryldiana. Welcome to this month’s Blog Hop. I hope you have enjoyed visiting the various Blog Hops and seen some lovely Home Decor projects. I live in a village near Newmarket, England and living in the country you get to see so many flowers. 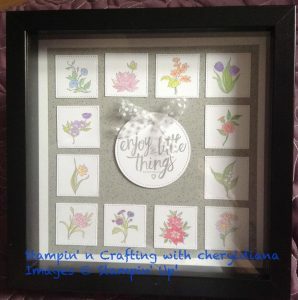 My project is a sampler in an Ikea Ribba frame. When I looked through the new catalogue I fell in love with the In Every Season stamp set and could picture various was of using this stamp set. First I die cut 3cm squares using the square Stitched Framelits. 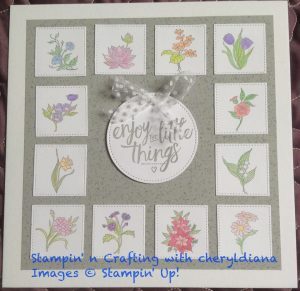 Then using Basic Gray ink I stamped the various flowers onto the squares. These were then coloured in using the watercolour pencils. I was so lucky as a demo to be able to order Set 2 of the watercolour pencils that are coming out in August. This gave me much more choices of colour to use. Then using a blender pen I carefully blended the colours together. The sentiment from Layering Love stamp set was stamped in Smokey Slate and die cut out using a circle from Stitched Framelits. For the backing I cut Smokey Slate card stock into an 8″ x 8″ square. Using the dotty stamp from Waterfront stamp set and using Smokey Slate ink I stamped all over to make my own back ground paper. The flowers were then stuck onto the Smokey Slate background. The circle was stuck in the middle of the frame using dimensionals. A bow was made using the polka dot tulle ribbon and was stuck to the circle using a glue dot. I hope you have enjoyed looking at my project, please do leave comments as you hop through all the Blogs in this Hop. The next person to hop to is Mette to see her lovely Home Decor Project this month. Cheryl ~ This is lovely! What a great way to use the Every Season stamp set. Thank you Sara. I was trying to think of a way to use them other than cards. This project was even better that I though it would be. Thank you. I love how we have more choice now we have the second set of watercolour pencils to use.